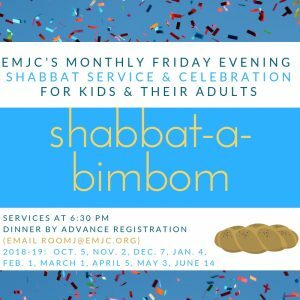 Everyone is invited to our lively child-centered Shabbat-a-BimBom services. The dinner that follows is for families who have reserved their spots no later than the Thursday morning before BimBom. Free for members, with annual subscription, mini-subscription (four BimBoms), and single visit passes available, all for up to 2 adults and 3 kids, in our Square store. We welcome first-time non-member visitors as our Shabbat guests. We’re available for a confidential discussion regarding the subscription rate for any family concerned the fee may prevent them from attending. Contact roomj@emjc.org for more information.